Those living in China on July 20, 1999, witnessed a campaign of suppression that seemed to have sprung from an earlier, darker era. Trucks circled Beijing’s streets, their blaring speakers warning citizens not to practice Falun Gong, or Falun Dafa, a popular traditional Chinese spiritual discipline. State-run television channels featured grave news anchors repeating, nonstop for days, the regime’s denunciations of the suddenly “illegal” practice. Students and teachers were made to engage in “struggle sessions” against Falun Gong, adopting the “correct” attitude toward the “deviant religion”—otherwise they were expelled from classes or dismissed from their jobs. And practitioners of the peaceful discipline, who petitioned Chinese authorities to cease the eradication of their faith, found themselves arrested and detained in labor camps and jails. There, they were subjected to brainwashing and torture, and in some cases killed for refusing to renounce their beliefs. It was a political atmosphere engineered to terrify and silence. “The Chinese Communist Party thought that Falun Gong practitioners wouldn’t dare to resist or speak out against them, much less file a lawsuit using their real names,” said a defiant Zhu Keming, a millionaire interior designer who began practicing Falun Gong in 1998, in a recent interview. Of course, that’s just what he did. Zhu, his wife, and her nephew were consumed by the injustice of the persecution, an open attempt to destroy an entire faith, and sought legal recourse from China’s own courts. 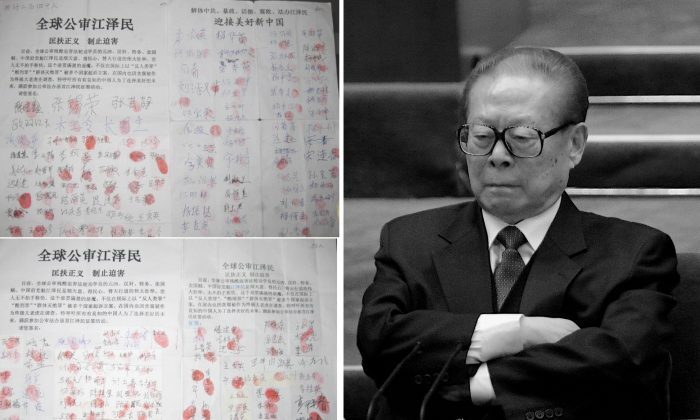 On Aug. 25, 2000, Zhu and his nephew-in-law (the wife’s name was removed from the filing at the last minute) became the first Falun Gong practitioners to file a criminal complaint against then-Party leader Jiang Zemin for his role in ordering the persecution. Their daring resulted in the arrest of Zhu Keming and Wang Jie, his nephew-in-law, followed by their lengthy imprisonment, horrendous abuse in custody, and then finally Wang’s death. Wang was released after suffering extreme torture in detention, and succumbed to his injuries six months later. Zhu emerged from jail five years on, gaunt, hairless, and short of nine teeth. Almost sixteen years later, hundreds of thousands of lawsuits have been filed against Jiang Zemin in the regime’s highest legal bodies. Some of the Falun Gong practitioners and other Chinese citizens who lodged the complaints have faced retaliation from local security forces, but nothing as severe as the treatment meted out to Zhu and Wang in the early 2000s. The wave of lawsuits against Jiang represents an unprecedented effort to bring a former Chinese dictator to justice. While Falun Gong remains the largest persecuted group in China today, the phenomenon of suing Jiang may provide the current Party leader, Xi Jinping, an acceptable means of solving one of China’s most gnawing social and political problems. Xi has an opportunity to end the campaign against Falun Gong, lay it at the feet of the leader who is responsible for it, and reconsider the future of China’s political arrangements—if it’s a choice he wishes to make. Chinese energy practices, known as qigong, had become extremely popular in China during the 1980s and 1990s, mainly because of the health benefits that practitioners felt. Despite the spiritual influences embedded in qigong, China’s atheist communist rulers supported the so-called “qigong fever,” and established research institutes that published serious studies on the phenomenon. Falun Gong was the star qigong practice of the 1990s. In 1992, Falun Gong founder Mr. Li Hongzhi introduced the exercises to the public, and didn’t charge the customary membership fee. Seven years later, an official Chinese Communist Party survey estimated that 70 million people in China from a broad segment of the population—from cooks and cleaners to soldiers and the secretary of an elite Party leader—were practicing Falun Gong. China Uncensored: What is Falun Gong? Duan Wei, the wife of Zhu Keming, said she picked up Falun Gong after witnessing its healing efficacy with her own eyes. At a park in Beijing, Duan ran into a practitioner who had been diagnosed with stage 4 liver cancer but looked perfectly healthy. “As a doctor, I know if someone has liver, heart, or kidney problems by looking at a patient’s face. But his complexion didn’t match the medical diagnosis,” said Duan, a well-regarded doctor who counted among her patients high-ranking Party generals and senior government officials in Southeast Asia. She spoke in Taiwan in an interview with New Tang Dynasty Television, an independent Chinese broadcast network that, along with this newspaper, is part of the Epoch Media Group based in New York. Duan introduced Falun Gong to Zhu Keming after they started dating in 1998. For Zhu, who had for years been occupied by making his fortune, the main draw of Falun Gong was the aspect of self-cultivation—the improvement of the self through adhering to the principles of truthfulness, compassion, and tolerance. Zhu’s workers were fascinated at the changes in their boss’s behavior and habits: Zhu the tough taskmaster became more understanding and courteous, and he went from drinking a dozen bottles of strong Chinese rice wine and beer each night to being a teetotaler. 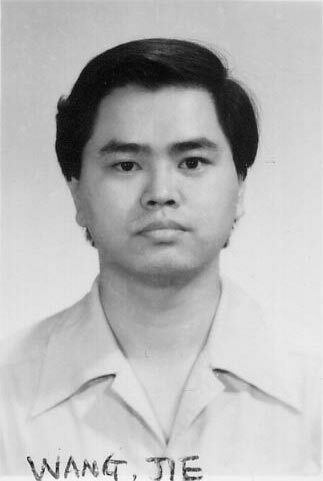 Wang Jie, then 36 years old, was one of Zhu’s workers and a Falun Gong practitioner. He had told his aunt Duan that her suitor wasn’t an easy person to get along with, but revised his assessment after realizing that Zhu was constantly improving his character in accordance with Falun Gong’s teachings. Zhu and Duan later got married. After reigning Party leader Jiang Zemin suddenly took notice of Falun Gong, he hastily determined that it ought to be “eradicated”—a bid to entrench his own dominance in the Party while he was at it, according to analysts of Communist Party politics. “Can it be that we Communist Party members, armed with Marxism, materialism, and atheism, cannot defeat the Falun Gong stuff?” Jiang wrote in a letter to top Party members after 10,000 Falun Gong practitioners staged a protest outside Zhongnanhai on April 25, to petition the authorities for an end to illegal harassment following the arrest of some practitioners in Tianjin. The situation appeared to be resolved amicably by Premier Zhu Rongji. But on July 20, 1999, Jiang launched the persecution of Falun Gong. Worse, practitioners everywhere were being rounded up by the regime’s security apparatus for arrest, then sent to detention centers, psychiatric wards, and labor camps to be worked and tortured to death. Zhu, Duan Wei, and Wang Jie first sent letters to Party leader Jiang explaining Falun Gong and requesting a halt to the persecution, but never received a response. 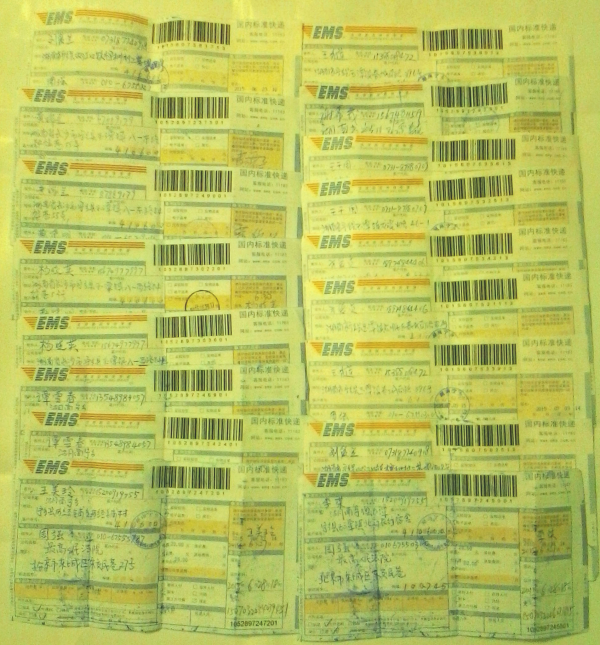 They then sent thousands of similar letters to other regime officials, and to the media in the mainland and abroad. Their pleas fell on deaf ears. Soon, accounts of practitioners being tortured to death started appearing on Minghui.org, a clearinghouse for firsthand information about the persecution. The persecution deaths convinced them to do the unthinkable—bring a lawsuit against a ruling Chinese leader for crimes against humanity. Zhu found that Jiang had violated several articles of Chinese law because he hadn’t legally banned Falun Gong, not to mention he had unleashed a campaign of state-led, organized torture. Zhu, Duan, and Wang buried themselves in books on Chinese constitutional, criminal, and criminal procedure law. They found that Jiang had violated several articles of Chinese law because he hadn’t legally banned Falun Gong, not to mention he had unleashed a campaign of state-led, organized torture. They concluded the best way to seek legal recourse was through the submission of a written criminal complaint to the Supreme People’s Procuratorate, the regime’s highest prosecuting body. The original complaint against Party leader Jiang Zemin, security chief Luo Gan, and then-head of the Party Organization Department, Zeng Qinghong, featured the signatures of Zhu Keming, Duan Wei, and Wang Jie. Expecting a fierce reprisal, Zhu and Wang later removed Duan’s name, and mailed the amended version in August 2000. The next attempt by a Falun Gong practitioner to bring Jiang Zemin to justice in mainland China had to wait till May 15, 2015. 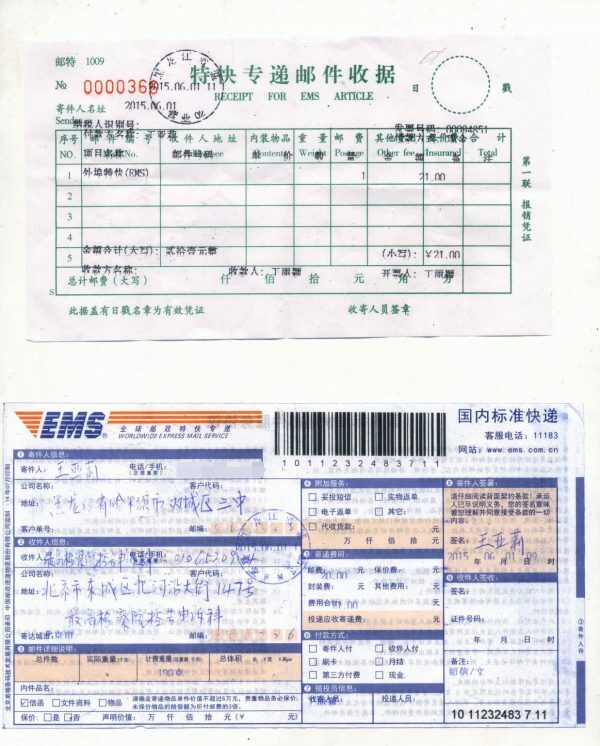 Zhang Zhaosen, a Falun Gong practitioner from the province of Hubei, handed a criminal complaint against Jiang to a representative from the state prosecutor in the middle of his trial (for “disseminating information about Falun Gong on the Web”) in Hubei’s Xiangyang Intermediate Court. The court received the documents and Zhang went home unharmed. 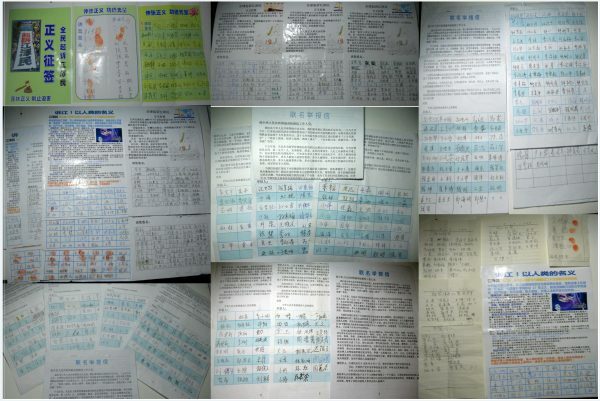 Inspired by Zhang’s success, Falun Gong practitioners across the country sent their own legal complaints to the Supreme People’s Court and the Supreme People’s Procuratorate. These complaints include accounts of persecution that individual practitioners or their kin had suffered; a list of crimes that Jiang had perpetrated; and the specific Chinese constitutional and criminal laws that Jiang had violated while executing his persecution campaign. 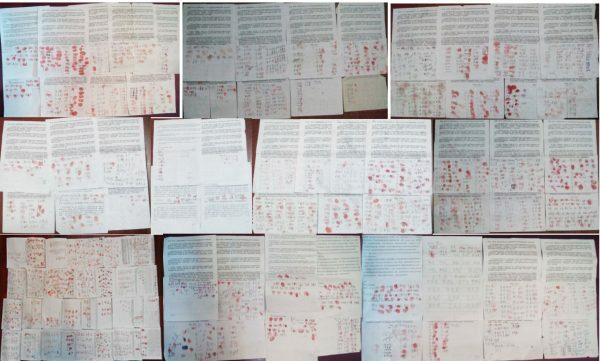 To date, over 209,000 Falun Gong practitioners and Chinese citizens have lodged complaints against Jiang with the regime’s highest legal authorities, according to incomplete data compiled by Minghui. The courts appear to be accepting the lawsuits, under a legal reform passed in May 2015 that requires the regime’s top legal bodies to accept and acknowledge all criminal complaints. Under the reign of Jiang and his immediate successor Hu Jintao, however, any attempt to start legal proceedings against a Party leader or even a retired one was unthinkable and impossible. It took Zhu Keming and Wang Jie’s failed effort in August 2000 to spark a very gradual change in the mindset of both the Chinese rights defense community and Falun Gong practitioners toward challenging Jiang’s persecution on legal grounds, according to Hugo Peng, a former human rights lawyer in China. “They were the first ones to eat the crab,” Peng told Epoch Times, using a Chinese idiom to describe a difficult activity when performed for the first time. “Without what they did, perhaps there wouldn’t be so many others who thought of using the law to scrutinize the suppression, as well as the crimes Jiang and others committed. In the evening of Sept. 6, 2000, Zhu Keming and Wang Jie were arrested in Duan Wei’s Beijing home. Duan later learned through her personal network that Jiang Zemin and his security chief Luo Gan had issued the order to seize her husband and nephew. Zhu and Wang were first taken to a secret detention facility in Beijing’s Fangshan district, then later to Beijing No. 1 detention center, an infamous jail that held political prisoners during the Cultural Revolution and after the Tiananmen Square crackdown. Zhu and Duan had presumed that Wang would be treated better in detention because his parents were high-ranking Party members. But Wang’s minders in the secret detention center, and later in the jail, were more interested in obeying Jiang’s instructions to physically “destroy” Falun Gong practitioners. In the secret detention facility, the prison guards stripped off his clothing and secured him under a dripping faucet, during fall in the frigid mountainous Fangshan area west of Beijing. They then, at their pleasure, delivered savage kicks to his back and chest. The internal injuries received from this abuse later contributed to his death, according to Duan, a medical doctor. In Beijing No. 1 detention center, the ankle cuffs that were put on Wang wore away his skin and exposed the bone. Wang later told Duan that he was put through many of the mind-bending torture methods administered on Falun Gong practitioners, as documented by Minghui at the time: terrible beatings, branding with cigarettes, toothpicks rammed under fingernails. At one point, Wang was beaten into a monthlong coma. When Wang was released on bail on Nov. 30, 2000, his body had been nearly destroyed—he required dialysis every other day and had no control over his bladder or bowels. In April 2001, some friends smuggled Wang out of China to Indonesia, where his aunt Duan was then residing. A little over a month later, he collapsed on the cold tiles of her bathroom floor and died. Duan found an Indonesian hospital to perform an autopsy to determine the exact cause of her nephew’s death. After conducting the autopsy, but before writing the report, the doctor told her: “The heart is twice the normal size … an injury like this isn’t sustained in a day.” The doctor said the kidneys had shrunk, too. All that was left was to collect the official report at the end of the week. But when they went to the hospital, Duan found the doctor had unexpectedly taken an overseas trip. They made multiple visits to the hospital, until the doctor finally returned a month later. Then, he delivered a report with the unexpected conclusion that there was nothing wrong with Wang Jie’s body. “We knew that they’d been bought off,” Duan said. Zhu spent five years in prison and was put through similar tortures—the prison guards shocked his head, armpits, and groin with high-voltage electric prods, beat him, and deprived him of sleep by forcing him to sit atop a small plastic stool for six days straight. He was released in 2006. Some of those who bring legal complaints against Jiang Zemin today still face arrest and detention, but no cases of abuse have been recorded that parallel what happened to Zhu Keming and Wang Jie. The case of Sheng Xiaoyun, the mother-in-law of YouTube celebrity Ben Hedges, is an example. Last October, security officers in northeast China barged into Sheng’s home and arrested her after she had mailed a criminal complaint against Jiang. A number of Falun Gong practitioners in Daqing City in Heilongjiang, a province that ranks among the most severely persecuted regions in China, were also imprisoned with Sheng. However, while in detention, Sheng and the other practitioners were allowed to perform Falun Gong exercises and recite Falun Gong’s teachings. When Sheng was released 10 days later, the police even returned the computer that they had seized. “Police treat Falun Gong practitioners better these days. They know that practitioners are good people who have been mislabeled,” she said in a phone interview. Zhang Zanning, the law professor, thinks that officials in the public security and the legal system are slowly recognizing that the persecution of Falun Gong was a mistake, and are waiting to see how the political winds change. Since coming to power, Xi has purged many of Jiang’s lieutenants and their cronies as he consolidates his control over the regime. Men like former Politburo member Bo Xilai and former security czar Zhou Yongkang are known to have been deeply involved in persecuting Falun Gong. Even Li Dongsheng, head of the extralegal agency created by Jiang to eliminate Falun Gong known as the 610 Office, was purged—an unmistakable signal that persecutors would no longer be immune. Xi has recently been “making all these moves that are at least ambiguous,” such as the “displacement of the Jiang Zemin faction” and the “taking over of the 610 Office leadership,” said Andrew Junker, a sociologist at the University of Chicago who is writing a book about Falun Gong, in a previous interview. “I see no benefit for Falun Gong to polarize its relationship with Xi Jinping; it makes total sense to open the door as much as possible, to encourage him to make a step in the right direction,” Junker added. By placing sole responsibility of the persecution on Jiang Zemin in their criminal complaints, Falun Gong practitioners could have unwittingly presented current Party leader Xi Jinping an opportunity to end the persecution and not immediately implicate his leadership. Meanwhile, Jiang Zemin and his sons are said to have had their movements restricted in March, and could now be held under some form of soft detention, according to sources familiar with the circumstances who asked to remain anonymous for security reasons. In an earlier interview with Epoch Times, Zheng said that many residents of Shanghai and human rights lawyers support the movement to bring Jiang to justice, and he volunteered to be the chief prosecutor when Jiang’s case goes to court. In light of the lawsuit wave, Zhu Keming decided to mail another legal complaint. “Falun Gong practitioners are not suing Jiang Zemin for the sake of suing Jiang Zemin … So many practitioners’ families have, due to the persecution, been broken up; some have been killed for their organs, so how can we remain indifferent?” he said. Juliet Song and Matthew Robertson contributed to this report.